The Footprint Ghosts are one of my favorite Halloween crafts! Just press a painted white foot on a colored piece of paper and add in the eyes and mouth. You could draw in the facial features or use the pinky finger for the eyes and the pointer finger to make the mouth. I have also used googly eyes like in the footprint ghosts we made last year. It was so much fun to see how much his little hands and feet grew since last then! To make the Handprint Spider, paint all but the thumbs black on both hands. I overlapped the 2nd handprint with the palm area in the 1st hand. Some moms like to have the whole handprint~ that’s OK too! Looking for more ideas? 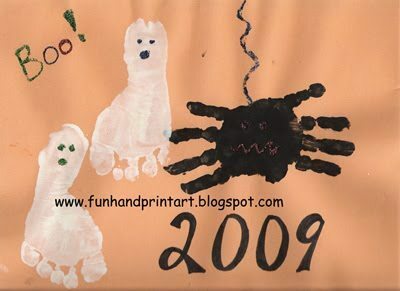 Check out the other Halloween handpint/footprint art we have made in the past and stop by my other blog, Crafts~N~Things for children, to see other spooky crafts, activities, & decorations we have made.